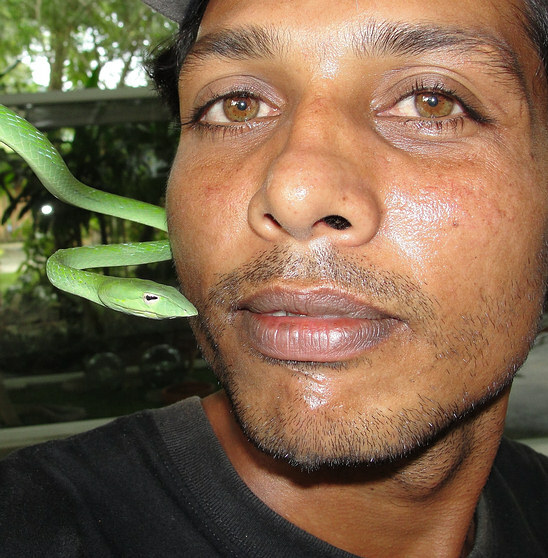 Jackie is a snake handler and will be doing the Cobra shows in Ao Nang in a few months. He’s really friendly and goes out of his way to make visitors feel comfortable around the snakes. hi im only 10 but I am fascinated by snakes and want one for my 11th birthday (in may). Know any good non venomous ones? Red tailed pipe snakes if you can find some that were born in captivity… they are very calm… awesome colors, and they eat lots of things – ant eggs, termite eggs, and even other snakes if they can find one. Cheers!